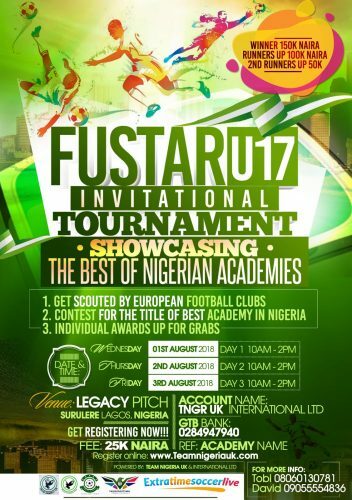 Management officials of Team Nigeria (UK) International group announces the staging of FUSTAR U-17 invitational tournament, aimed at showcasing the best of Nigerian academies. The invitational tournament will avail participants opportunity to be scouted by European clubs and the privilege to contest for title of the best football academy in Nigeria. 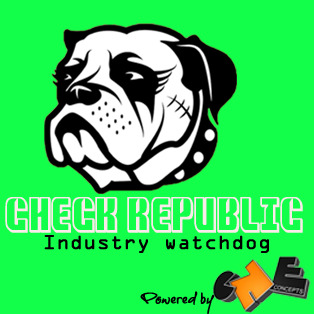 While individual awards will also be up for grab. The tournament will take place at legacy pitch, Surulere, Lagos, Nigeria from the 1st of August to the 3rd of August, 2018. Winners of the invitational tournament will go home with #150,000 cash prize, while the first runner up will receive #100,000 and the second runner up wins the sum of #50,000. Team Nigeria UK, Nigeria’s official sporting team in diaspora is known for viable and reliable sports development projects over the years across, Nigeria, United Kingdom, Africa, Europe and USA. We presently working to towards the uplifting of Nigerian descents players and Nigerian players across the diaspora and back home. The debut FUSTAR U-17 invitational tournament by Team Nigeria international outfit is for young footballers from age 14-16years as 16 teams will be participating at the maiden edition. Hopefully, the grassroot sports organisation, is working to stage another tournament before the end of 2018, which will allow young footballers from the age of 16-18 to participate as foreign clubs are looking to scout for talented young footballers, through the FUSTAR initiative. Ahead of the tournament, organisers of the football event is using this opportunity to invite all sports writers in Lagos and Nigeria to participate at the pre-tournament press conference slated to hold on the Saturday 28th of July, 2018, at SWAN Lagos, Nigeria. On their agenda at the press conference, is the opportunity to unveil some of ideas the organisation has put together, to develop, grassroot football in Nigeria and in extention to other parts of Africa.